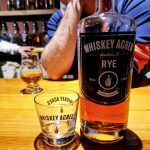 Last July we gave you a peek inside Whiskey Acres Distilling Co located in DeKalb, IL. It was one of our most popular articles of 2016. 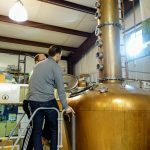 When the distillery invited us back to spend the day hands-on distilling and bottling we jumped at the chance. Last time, we hung out with owner Jim Walter. 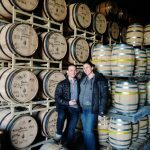 On this visit we got a chance to spend time with the other two distillery owners, Nick Nagele and Jamie Walter. Along with their assistant distiller Rob Wallace. 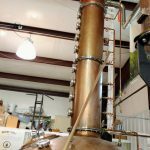 Check out our original article and tour of the farm distillery, click here. 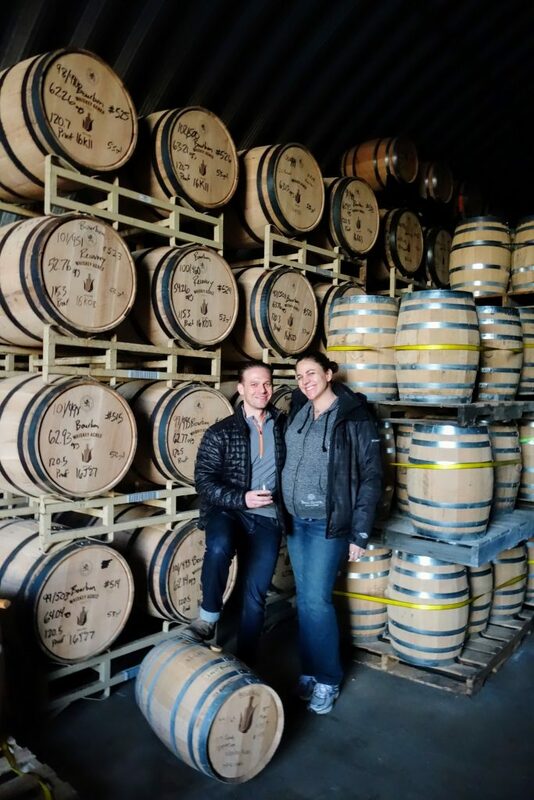 My wife and I arrived at the distillery on a Tuesday morning at about 8:30. Nick and Rob had already warmed up the steam boiler and we were ready to roll. The boiler is the heat source for the mash cooker where we would soon be adding our grains. The boiler is powered by a natural gas line running under the farm. This feature may seem trivial but it is critical to their commitment to sustainability. On this morning it didn’t take long to heat because the hot water from the previous day’s cook was circulated back to the boiler. 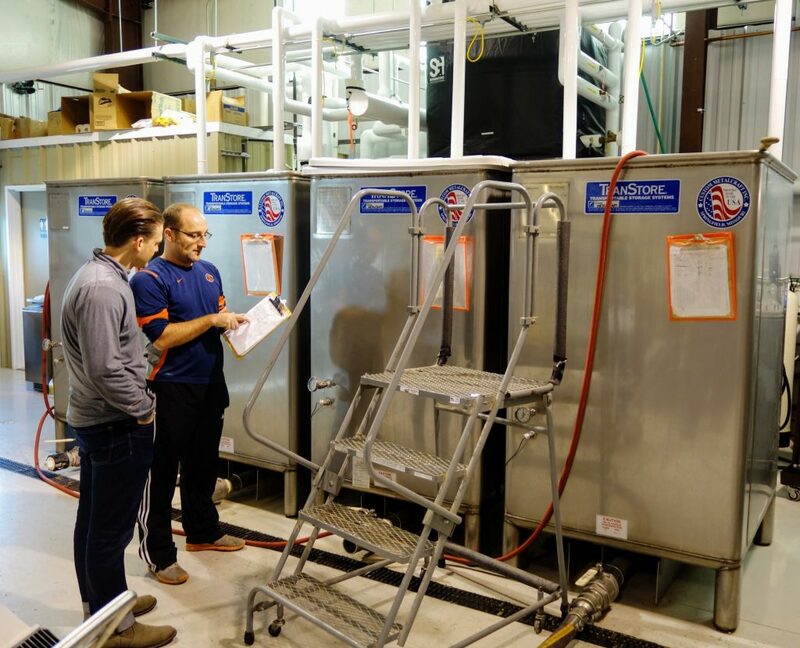 This process allows them to start the next day with water that is already warm. A key to optimizing the work day, especially in the coming winter months. 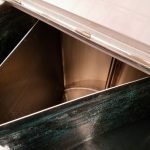 This is the ‘Mash Tun’ or ‘Mash Cooker’. This is where the grains are combined and boiled to make the wort. Once the boiler was up to temp, naturally filtered limestone water was added to the mash cooker. One of the keys to great Kentucky Bourbon is the naturally filtered limestone water native to the area. 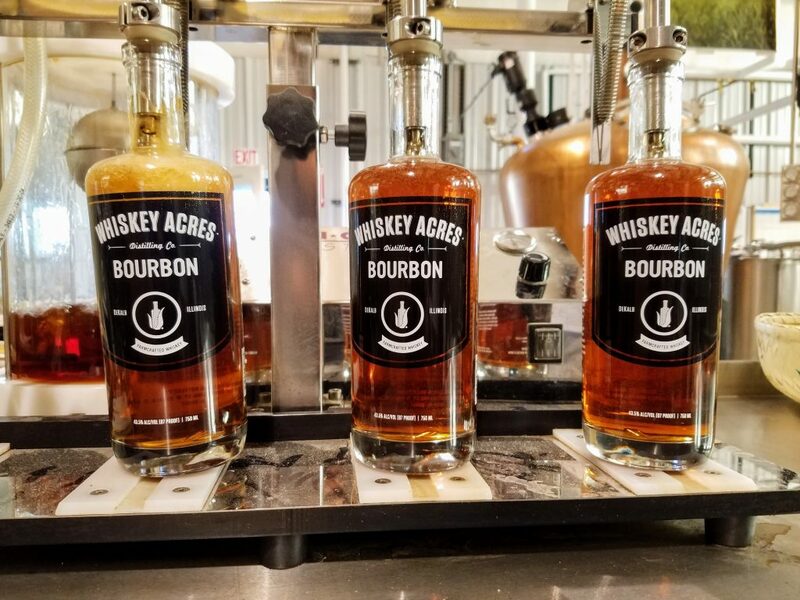 Whiskey Acres happens to sit on top of an aquifer that produces their very own limestone filtered water. Now it’s time to mill, or grind, the grain before adding to the mash cooker. 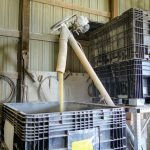 The milling happens in a barn just nextdoor. Nick tells us they do this for a few reasons. Milling in a different building ensures that no dust or debris from the mill floats into the distillery. And having the mill so close allows them to mill grain right before they use it. 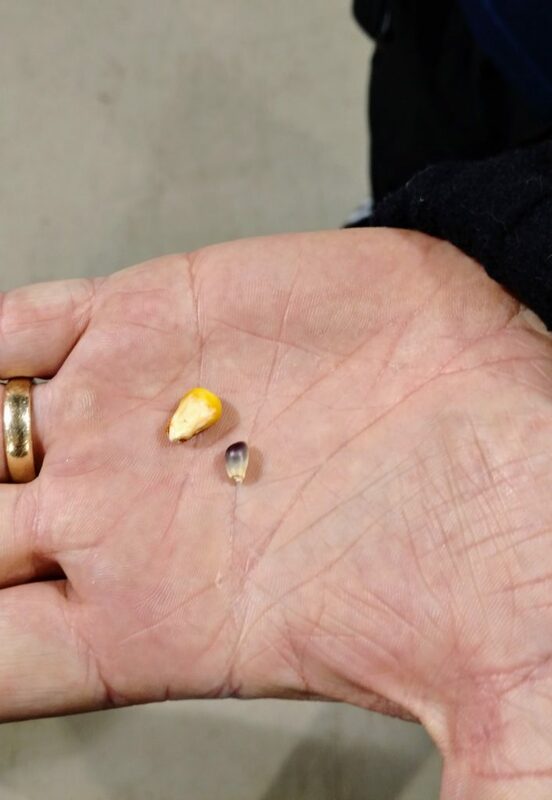 Nick showed us a jar of dull gray looking corn milled last week. 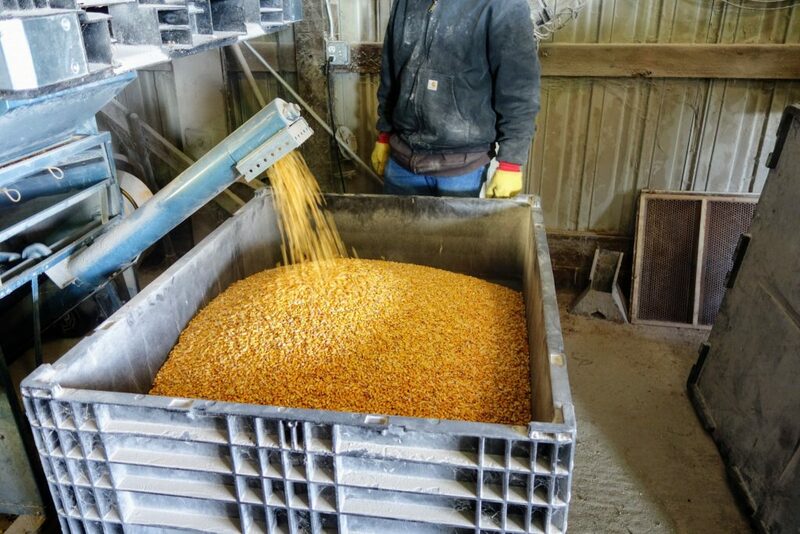 Then led us over to the mill where he grabbed a handful of bright, fragrant corn coming off the running mill. The difference is very noticeable and we have to believe it makes a difference in the final product as well. 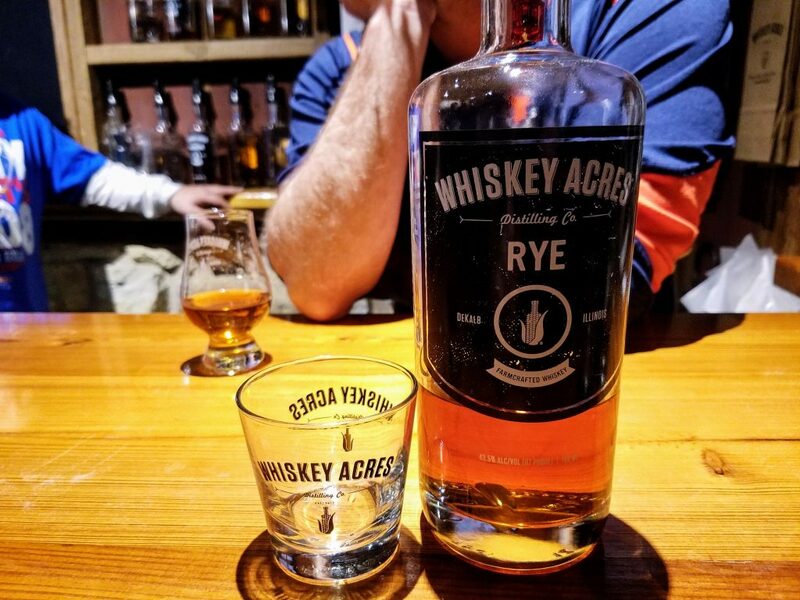 Whiskey Acres is a farm distillery which means they grow, harvest, and mill most of the grain used on the distillery. All of the corn, rye, and wheat is grown by the family just beyond the distillery walls. The only grain not currently grown there is the barley. 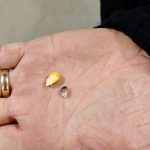 They use such a small amount of barley it wouldn’t make much sense to grow and malt it themselves. Nick says maybe one day, but for now it’s sourced from a nearby producer. On this particular day we made a bourbon mash of part yellow dent corn and part blue popcorn. 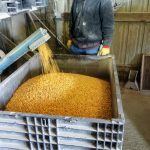 The blue popcorn is actually blue in color and makes for an impressive sight as it blends with the yellow corn pouring into the cooker. This is done by hoisting the grain over the cooker with a forklift. 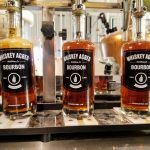 While parts of Whiskey Acres are automated, much of the work done here is done by hand and closely monitored. 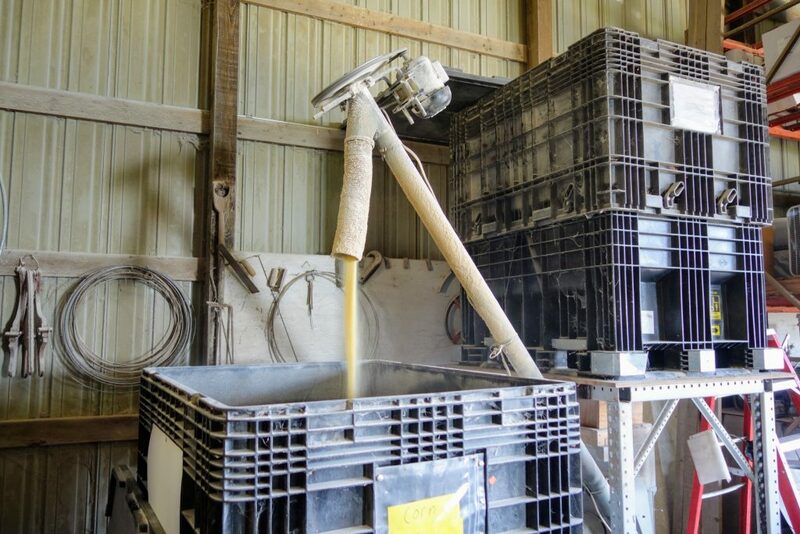 The milled corn is lifted and poured into the mash cooker. Now that the corn has been added to the cooker it will be brought to a boil and held there for 30 minutes. The mash will then be cooled and different grains will be added at different temperatures. 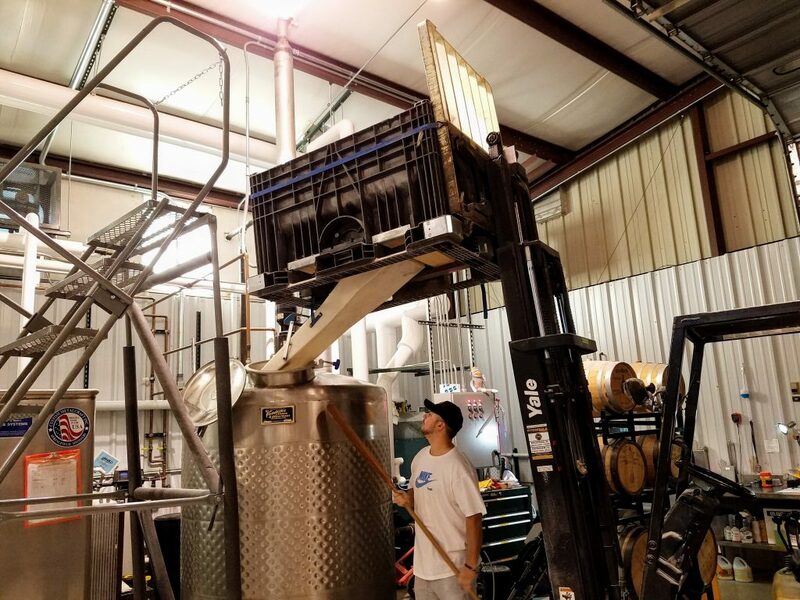 Ultimately it will be cooled to 90 degrees in preparation of transfer to the fermentation tank. 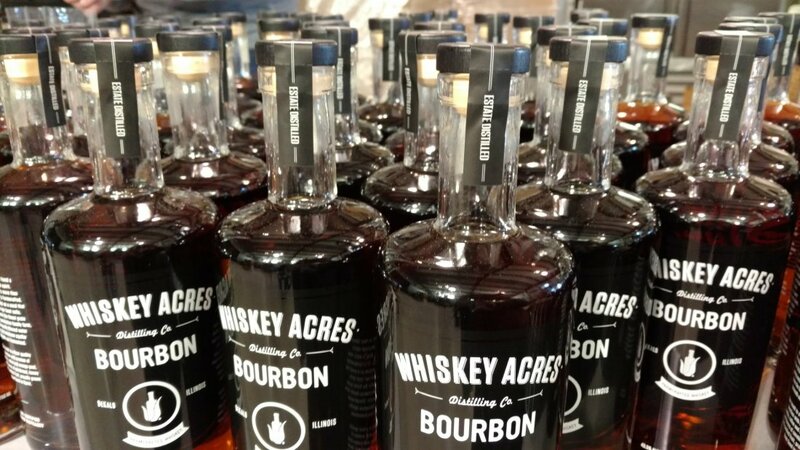 The mashbill for Whiskey Acres Bourbon is 75% corn, 15% wheat, and 10% malted barley. When the cook is complete the mash, aka. 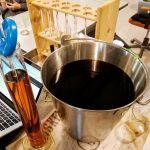 “wort”, is a sugar rich solution ready to be converted to alcohol! The wort is pumped to the fermentation tank where it is held at 90 degrees. This is when distillers making a “Sour Mash” Bourbon would add some of the backset from the previous cook. But because Whiskey Acres uses a Sweet Mash process we’ll use only fresh ingredients at this step. We now add minerals to balance the pH of the wort. This is also the time to add one of the 5 yeast strains they’ve chosen. 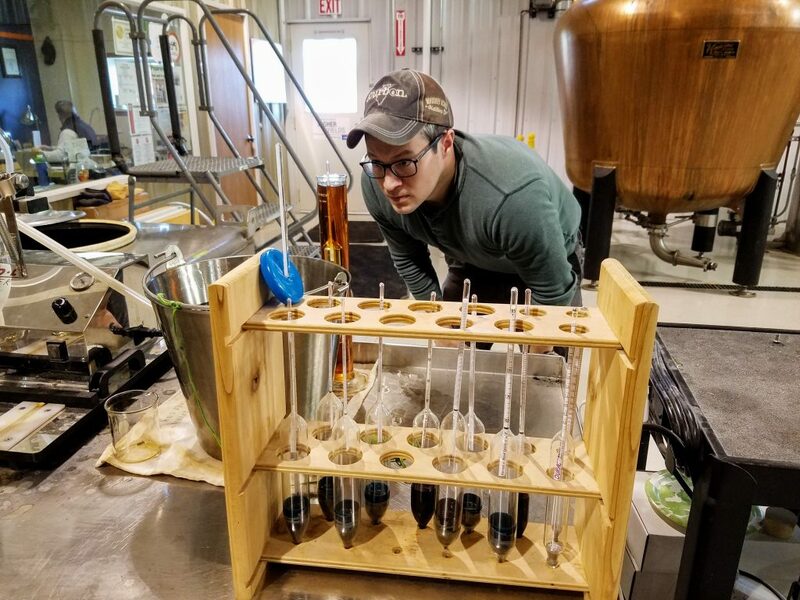 Yeast is a critical ingredient to making all alcohol. Yeast cells eat the sugar in our mash and poop out alcohol. After the yeast has its way for 3 to 5 days the mash is now known as “wash” or “distillers beer”. It contains about 10% alcohol at this point. Sour Mash: Adding a small amount of mash from a previous cook to each new cook. This helps balance the pH of the new cook and is believed to provide consistency of flavor. Sweet Mash: No previous mash is used, only new ingredients. Other methods retain a consistent pH. 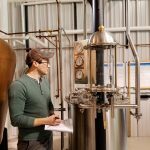 With current sanitary methods some distillers believe this process yields a more consistent flavor. For today’s run Rob and Nick had a fully fermented wash ready to go. 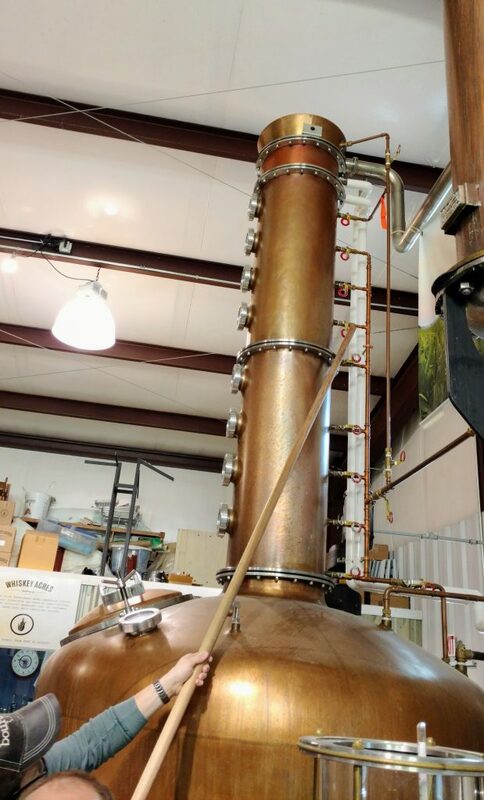 We pumped the wash into their custom Vendome Copper & Brass Works hybrid still and began to heat it with steam. In my opinion this part is the most fun and requires the most skill and experience. This is when we begin to distill the wash to produce the high proof “new make” or “white dog”. As the still began to boil Rob opened the plates in the column part of the still and the whiskey began to flow. 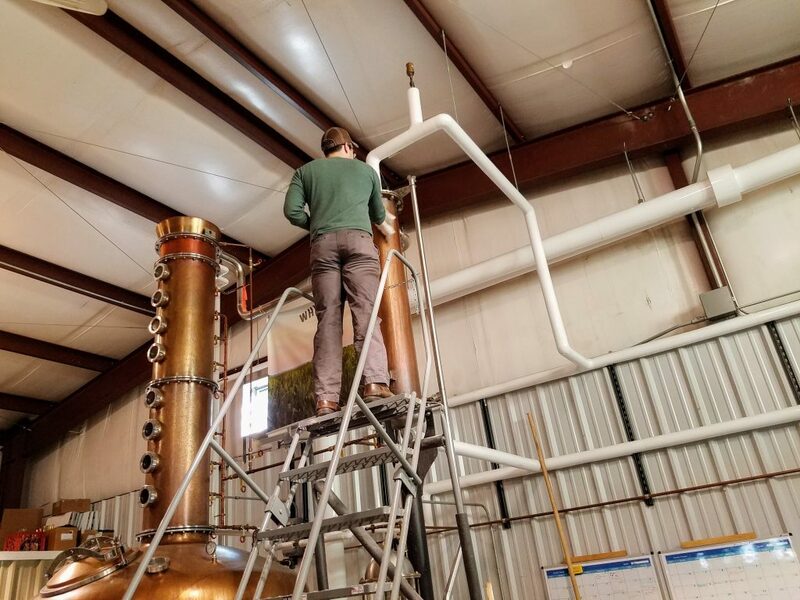 Alcohol vapor made its way to the top of the still where it moved to the condenser to be converted back to a liquid. 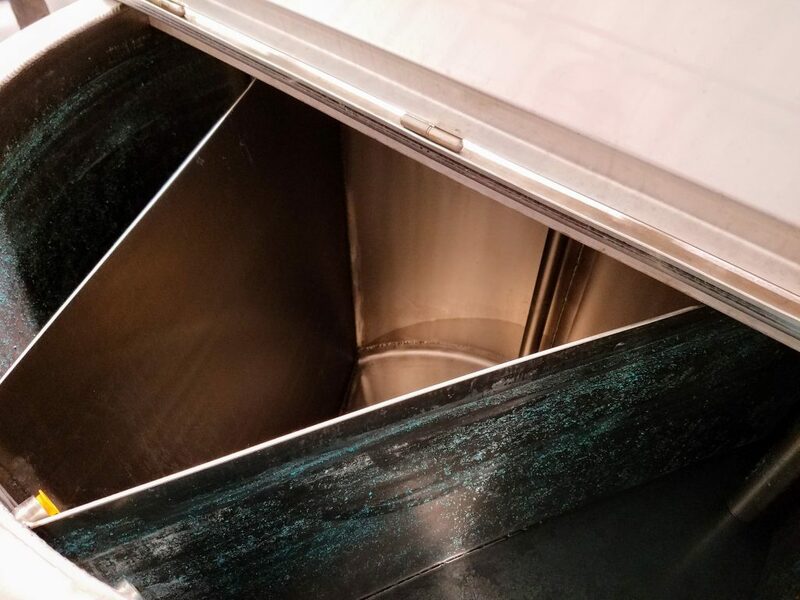 From here it moves to the “spirit safe” where it slowly percolates and is gathered. The heavy copper lid lifts off, Nick and Rob dip a finger in and taste the whiskey then I do the same. The smell and taste is predominantly….nail polish. These are the “Heads” and do not yet contain the ethanol we’re looking for. I notice small green flecks bubbling up in the heads and ask Nick what I’m seeing. He chuckles and says that’s the still sacrificing a bit of itself in each run. The copper in the still is breaking down and tiny pieces make their way into the heads. As we monitor the spirit safe the pace of the whiskey coming through picks up, the green flecks disappear, and the taste becomes sweet. The heads portion of the run completes in under 5 minutes. Now we have the “Hearts” and this is when Rob makes the first “cut”. He pulls a lever to direct the Hearts to a new tank, away from the heads. There are thermometers and hydrometers providing measurements along the way but Nick tells me those are just guides. Their senses of smell and taste are what truly signal the time to make cuts. Learning this skill takes time and experience. 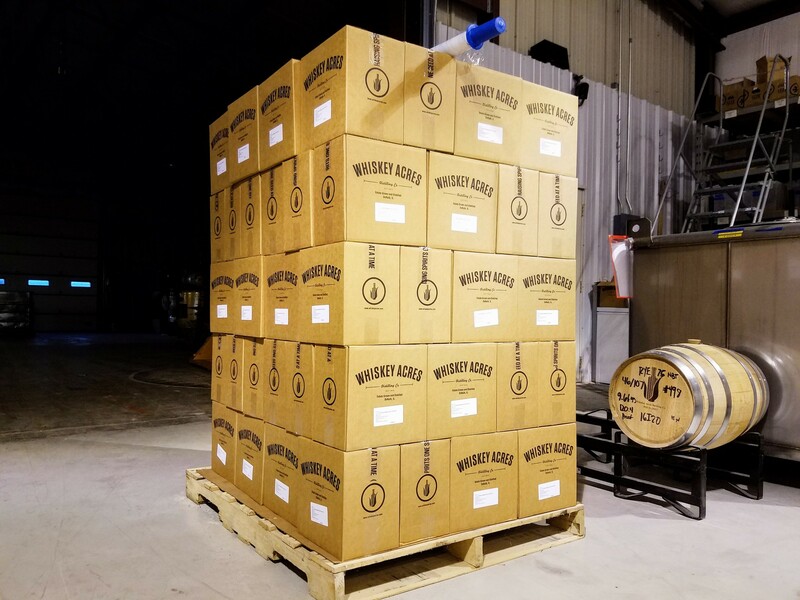 In our last Whiskey Acres article we talked about the guys bringing in Dave Pickerell to help them get setup. 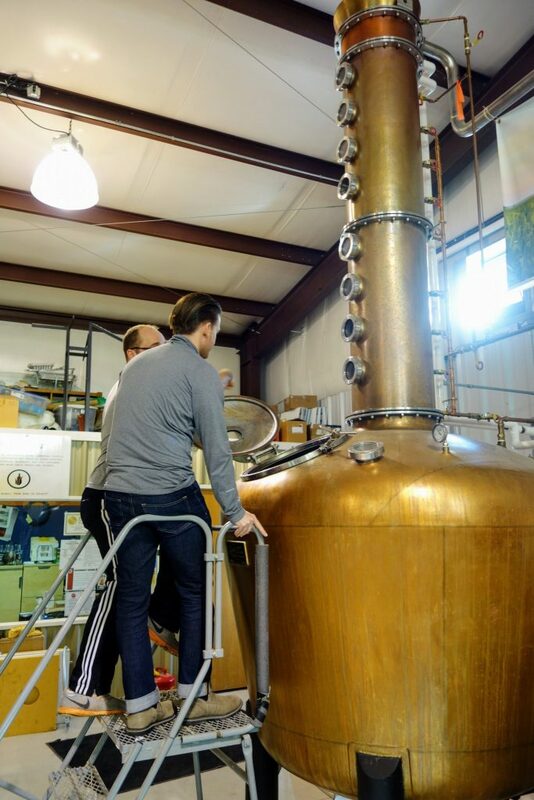 Nick and the guys learned from Dave’s decades of distilling experience. Foreshots: The very first distillate off the still, this contains volatile chemicals including acetone. It is discarded. Heads: Next comes acetone, methanol, ethyl-acette and ethanol. Slightly sweet but still a strong ‘nail polish’ smell. Hearts: The good stuff. Mostly ethanol. Sweet on the nose and palate. This makes up most of the run. Tails: Contains fusel oils which may be desirable in smaller quantities in the final product. A full day at Whiskey Acres yields a single barrel of craft Bourbon. 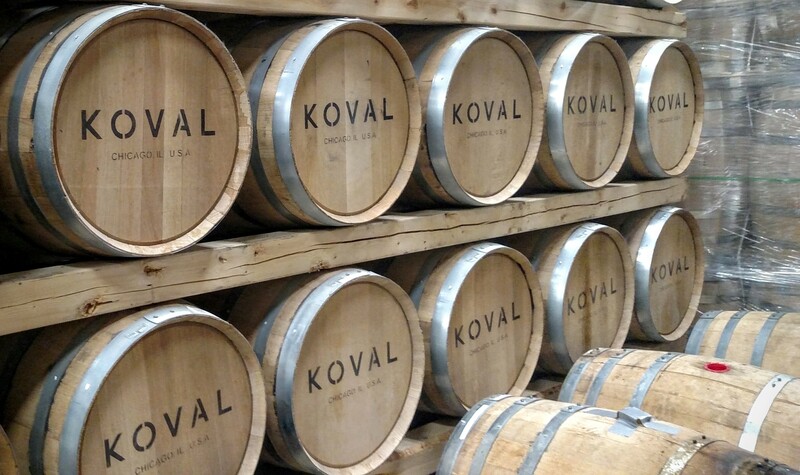 A large scale distillery may fill over 1,000 barrels a day. After lunch we moved to one of the final steps in the operation, bottling. They weren’t filling any barrels that day so we skipped that step. If we had filled a barrel Nick tells us they get one barrel per distillation run. 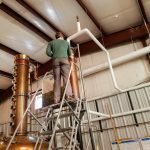 This should give you an idea of the scale of a craft distillery compared to the big boys. A full day at Whiskey Acres yields a single barrel that won’t see the inside of a bottle for a months or years. 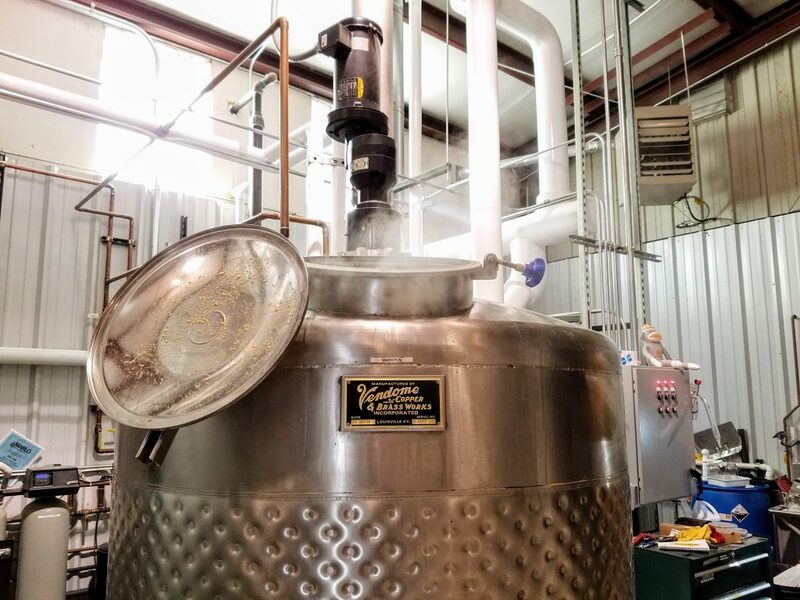 A large distillery may fill over 1,000 barrels per day! The guys did have a 500 gallon container of freshly dumped aged Bourbon ready to be bottled and we got to work. Rob had already proofed it down to bottling proof using de-ionized water. This type of water is used because it leaves in minerals and gives a better mouth feel. Nick setup and calibrated the bottling machine, something they do with each bottling run. I began unboxing bottles and Rob showed my wife how to affix the tax stamps and plastic shrink wrap that would seal each bottle. 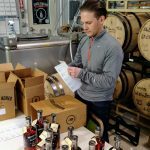 We measured, filled, corked, labeled, sealed, and boxed nearly 600 bottles. Other than the precise filling, the process is done by hand taking care to inspect each bottle along the way. 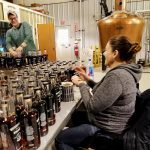 Today we had a small team but usually on their monthly bottling days Whiskey Acres accepts volunteers through their Facebook Page. 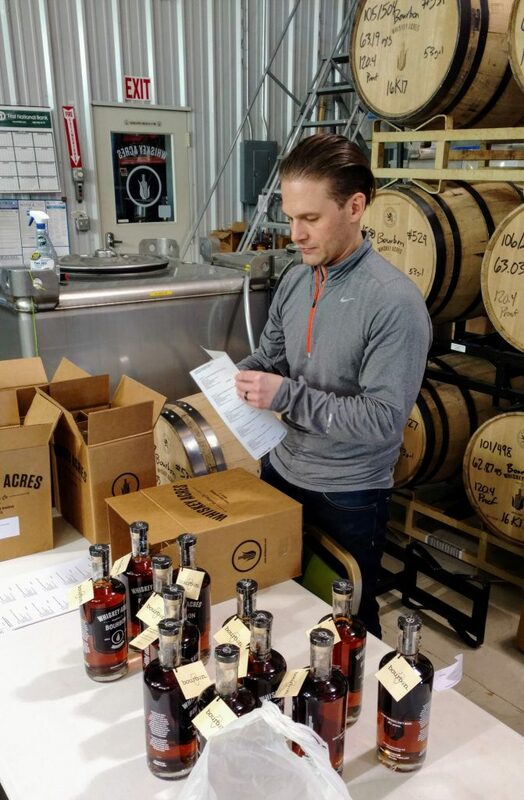 As we wrapped up bottling in walked a couple on schedule to taste barrels for a private barrel selection. 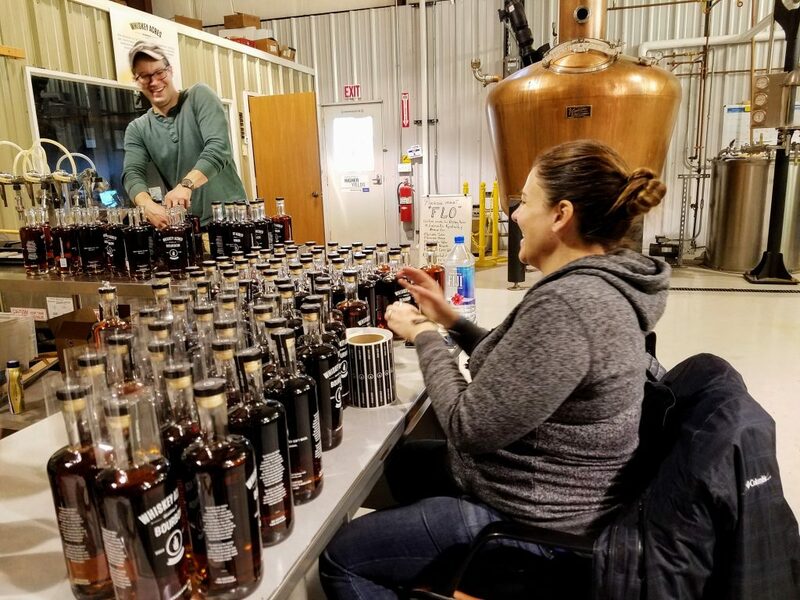 John McIntyre and his wife were ready to pick their next Whiskey Acres Single Barrel for their Hy-Vee store in Sycamore, IL. We first heard about John McIntyre during our last visit to Whiskey Acres. We even wrote about him in our previous blog post. But back then we referred to him as the “mad whiskey scientist”. 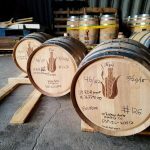 On this visit we got a chance to meet John and even sample a full barrels with him. He started with a handful and narrowed it down to just a couple. After the first single barrel he bought from Whiskey Acres did so well at his store; John told us he’s looking for another unique flavor profile. After a few more sips he had found his barrel. 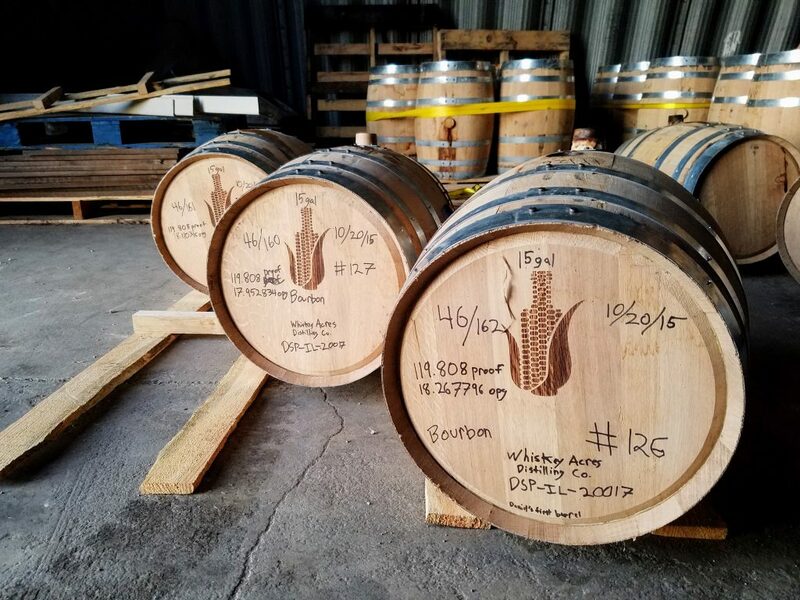 His name was written on the barrel head, a few photos were taken, and John will pick up his bottles, and empty barrel, just a few weeks later. 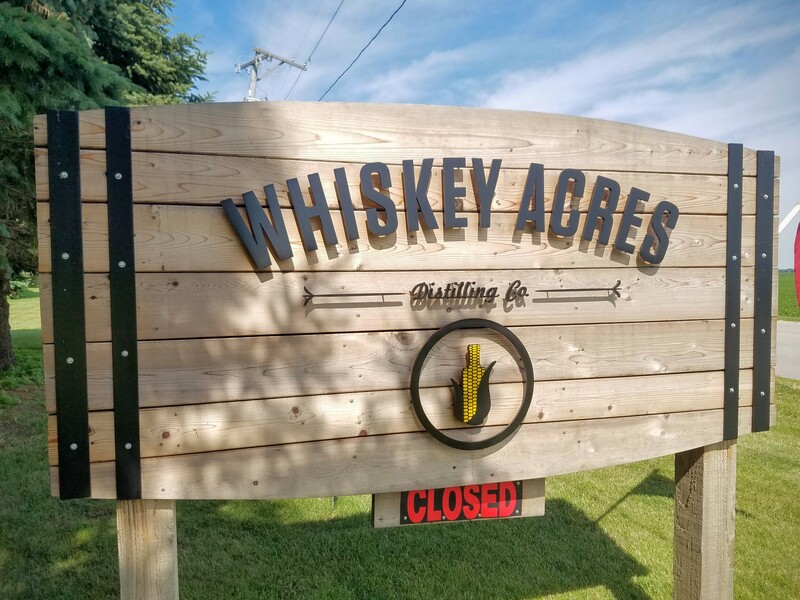 We finished our day in the Whiskey Acres tasting room. My wife and I were joined by Nick, Rob, Jamie, John and his wife. 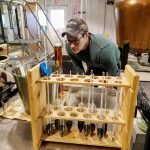 I sipped on their Bourbon and Rye while I soaked in the last few minutes of my day in the shoes of a craft distiller. 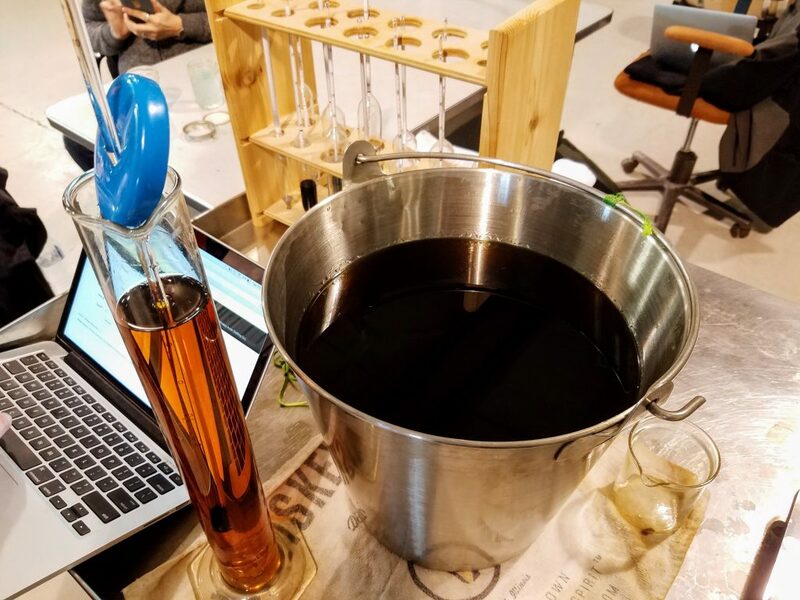 This was an incredible learning experience for us and will be reflected in Chicago Bourbon content as we continue to grow. 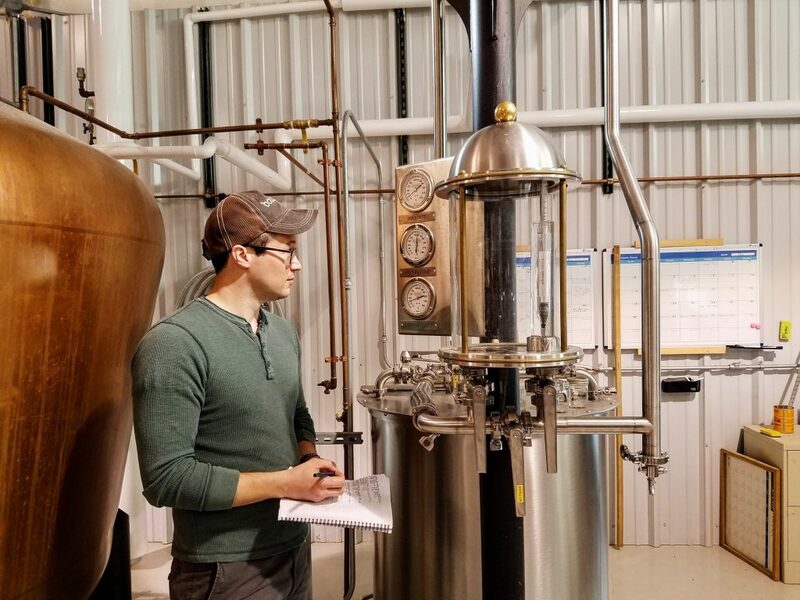 I would like to thank everyone at Whiskey Acres for taking us under their wing, explaining their process in great detail, and allowing us to help them craft their uniquely exception spirits. 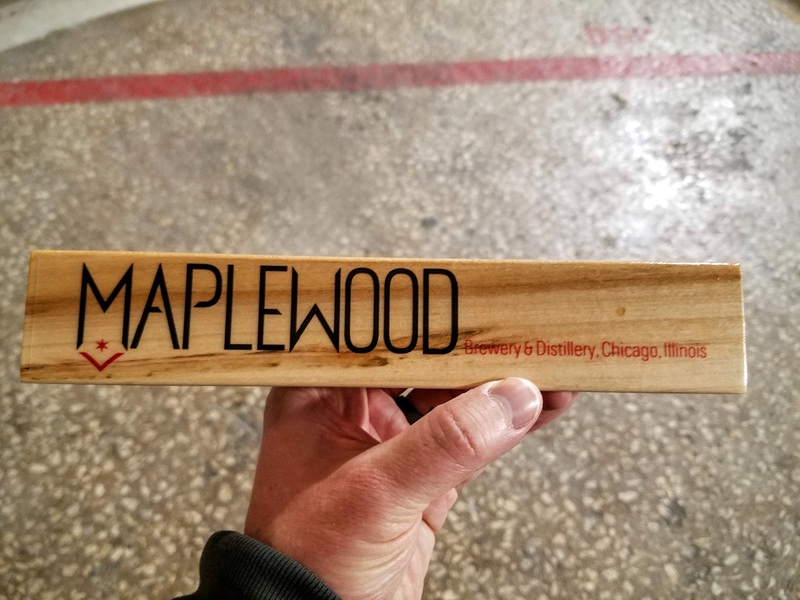 Next post You’ve Had A Store Pick, But Have You Tasted A Distributor’s Pick?